Don't hesitate. Experience the wonder of magic in the palm of your hand! Spellbinding wizardry and refined deceptions are the trademarks of D. W. Wilson's personal performances. Picture this, you autograph a dollar bill and with a wave of D.W. Wilson's hand it actually vanishes from between your fingertips! As impossible as this sounds, it's true. A padlocked, sealed brass container, held by an audience member is found to contain the bill you signed only mements ago. Imagine this. You examine a solid sheet of stainless steel. As you watch in awe, D.W. Wilson forces that sheet of steel right through both of your arms! You experience no pain or discomfort whatsoever, just the sensation of complete mystification. You'll definitely want to see this! D.W. Wilson is completely strapped, and buckled into a regulation strait jacket as tightly as possible by you. Without any cover or curtains, D.W. Wilson strains, struggles and fights to force his escape before your very eyes. You see it all and now you know why only a few accomplished artists can successfully feature the escape from a regulation strait jacket. 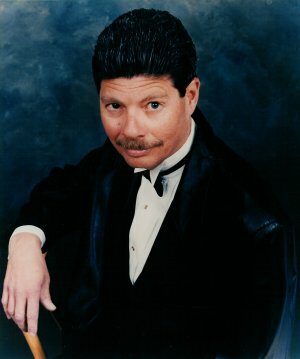 David Wayne Wilson is also a highly trained palmist. He often combines his very accurate palm readings with his strolling magic, entertaining table to table or group to group. Incredible, dazzling and breathtaking are just a few of the words to describe the artistry of D.W. Wilson. His unique combination of astounding illusions, hilarity and audience participation has made D. W. Wilson San Francisco's favorite comical conjurer. Indulge your guests in a celebration of pure entertainment with the acclaimed D.W. Wilson.